A perfect place for a stroll! Situated on a forested hill, overlooking huge psychiatric hospital grounds (with pretty buildings from last century), this place impresses by its ethereal beauty. 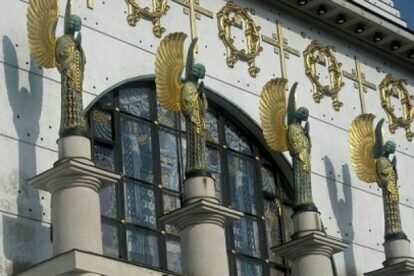 Built between 1904 to 1907 by drafts of famous Otto Wagner, the church did not suit anybody’s taste in the old days, but I’m sure that today no one can help oneself but fall in love with the golden dome, the graceful golden-winged angels. For € 8 it is possible to get a guided tour on Saturday at 15:00 and Sunday at 16:00, on Sundays you can get into the church from 12:00 – 16:00, but be sure to check out the website, especially in winter time as this is low season for guides… But even if you just have a look from the outside, it’s worth the ride out of town. There is also a nice path to a recreation area called Steinhofgründe, where locals like to go for a walk with kids, dogs etc and enjoy the first warm rays of sunlight in spring. Here you’ll find small ponds, old barns, places for picnicking in summertime and a grand view of Vienna, spread out beneath you. Gates are open from around 06:00 – 19:00, from April on until 21:00.